I routinely use my local coffee shop as a temporary office--and judging by the number of other laptop users I see there, I'm not alone. Invariably I end up needing something on my desktop at home--a file, an e-mail stored in Outlook, a Web link I bookmarked, or whatever. If only I could access my PC from afar! This week I've got an online solution to that problem, plus other hassle fixes. I'll tell you about LogMeIn, a Web service that gives you remote access to your home PC; TripIt, a travel site that aggregates all your trip-related e-mail into slick itineraries; and RebateRemedy, which promises to get rebate checks to you quickly. There are many solutions that afford remote access to other PCs, but I've yet to find one I like better than oldie-but-goodie LogMeIn Free. All you do is download and install the small LogMeIn utility (which is available for both Windows and Mac), set up your account and password, then leave your PC running when you leave the house. You can now interact with your home PC just as if you were sitting at it. (I recommend maximizing the LogMeIn window within your browser so you can enjoy a full-screen interface, which is much easier on the eyes.) Keep in mind that everything will seem a bit slower than usual, which is simply a by-product of remote access. Also, graphics may look a little splotchy, as LogMeIn intentionally reduces Windows' color depth to improve performance. If you do maximize the LogMeIn window, you'll need to move your mouse cursor to the top of the screen (near the center) to access its toolbar. I can't tell you how many times LogMeIn has come to my rescue. Confession: I'll sometimes fire up the app to remotely shut down my downstairs PC, just so I don't have to run the stairs. Ever notice how after you plan a trip, your inbox ends up stuffed with reservation confirmations, itineraries, and other clutter? Wouldn't it be great if you could manage all your trip details under one roof? That's the idea behind TripIt, a travel site that removes a lot of the hassle from travel management. After signing up for a free account, you simply forward all travel-related confirmation e-mails (i.e. those you get from airlines, hotels, car-rental outfits, etc.) 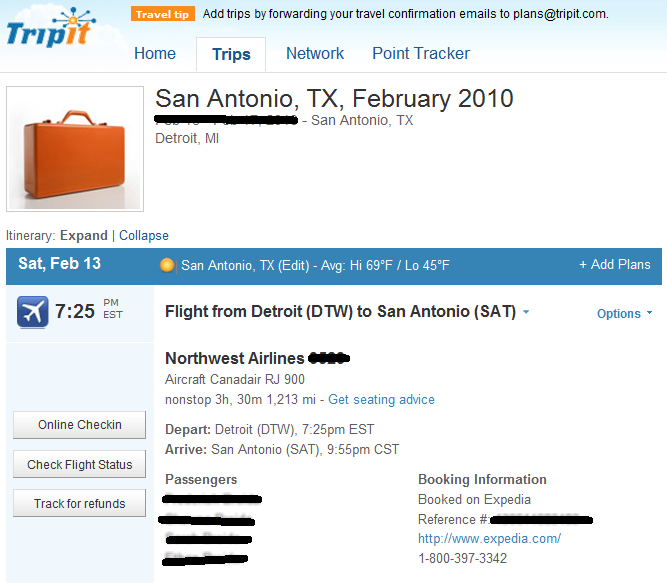 to plans@tripit.com. The service culls all the pertinent details from those e-mails and builds slick, chronologically organized itineraries, complete with weather forecasts, maps of each destination city, driving directions (from, say, the airport to the hotel), and more. You can add notes to each itinerary, share them with friends, check flight status, and even get airplane seating advice. Thankfully, there's also a mobile version of the TripIt site (m.tripit.com) where you can view all your trip details right on your phone. iPhone users will definitely want to check out the free TripIt companion iPhone app, which is basically just a spruced-up, easier-to-use app version of the mobile site. It's worth noting that the Pro version of TripIt ($69 per year) adds a few extra features like automatic trip sharing, mobile alerts about flight delays, gate changes, and the like, and tracking of your frequent-flyer and other travel-reward accounts. But I suspect most folks will be perfectly satisfied with freebie TripIt. I know I am. Mail-in rebates are a great way to score major discounts on products you want, but they have a (some would say deservedly) bad reputation. Sometimes you make a mistake on one of the forms and the rebate check never comes. Sometimes you do everything exactly right and the rebate never comes. Or the rebate finally arrives, but only after months of waiting. RebateRemedy promises to expedite the rebate process. You send your filled-out forms to the service; it cuts you a check (or credits your PayPal account) in a matter of days. What's the catch? Well, you can't get something for nothing: RebateRemedy takes a percentage of your rebate (20-30% to be exact, depending on the value), plus a $2.50 processing fee. Thus, if you're dealing with, say, a $50 rebate, $12.50 + $2.50 goes to RebateRemedy, leaving you with $35. But that's $35 you get in days, not months. What's more, if the service discovers any issues (like a forgotten UPC code or incomplete form) that would normally interfere with your rebate, it'll contact you so you can make the necessary corrections. Just make sure you send them your paperwork at least 10 days prior to the rebate expiration date, otherwise there won't be time to process it. I haven't tried RebateRemedy yet, and I'm not sure I'd bother with it for a rebate of less than, say, $20. But as someone who frequently grabs at dangled rebate carrots, I definitely like the idea.